We possess skilled team of creative graphic designers, programmers and web engineers who have the expertise to undertake any kind of website design including a static web design, dynamic or CMS based, photogallery, e-commerce web design or an interactive flash website design. Our team is also capable of bulding custom themes for famous CMS like Joomla, Drupal, Wordpress and any other CMS, shopping carts, CRM etc. We can integrate any asp, php or dot net web applications with any website and customize it's looks and feels for you. 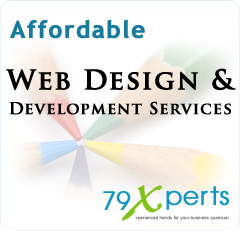 In short, 79Xperts is your one stop shop for web design, web application development, ecommerce solutions and ebusiness frameworks. You can rely on our world class capabilities, high end graphics, designer websites, wonderful graphical user interfaces (GUI), awesome animations and much more, all under one roof.